The sculpture outside the Cumberland County Sheriff's Office contains a small piece of steel from the World Trade Center. As a young member of the Coast Guard, Eric Colby loved the view of the skyline from his base in New York City. He said he was taking in that familiar scene on Sept. 11, 2001, when two planes crashed into the World Trade Center. Colby was one of many first responders who jumped into action that day. He said he helped transport injured people from Manhattan to the New Jersey side of the Hudson River on Coast Guard boats. 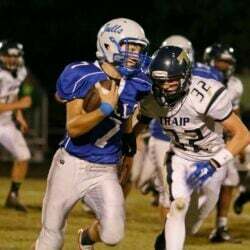 A back injury prompted Colby to leave the Coast Guard in 2006, and he now lives in Limington. 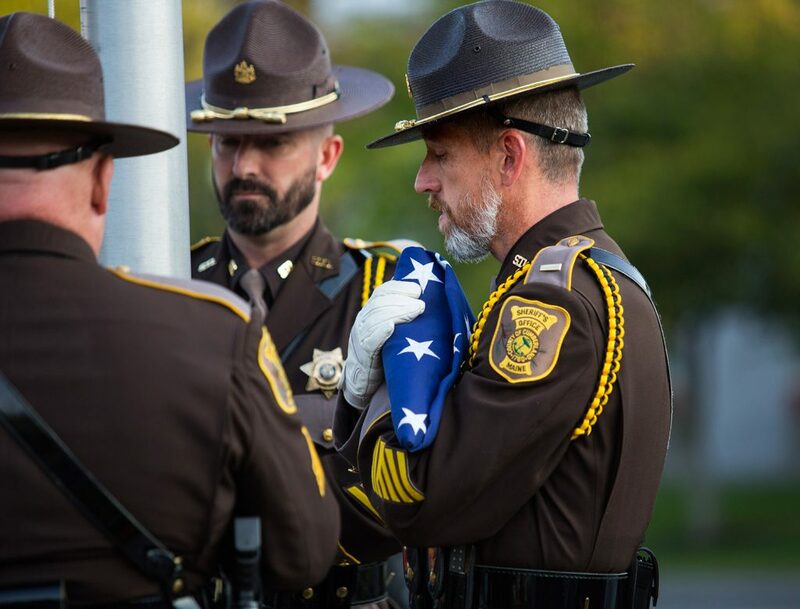 He was one of more than 70 people who gathered outside the Cumberland County Sheriff’s Office in Portland on Monday night for the unveiling of a memorial to commemorate the terrorist attacks of 16 years ago. 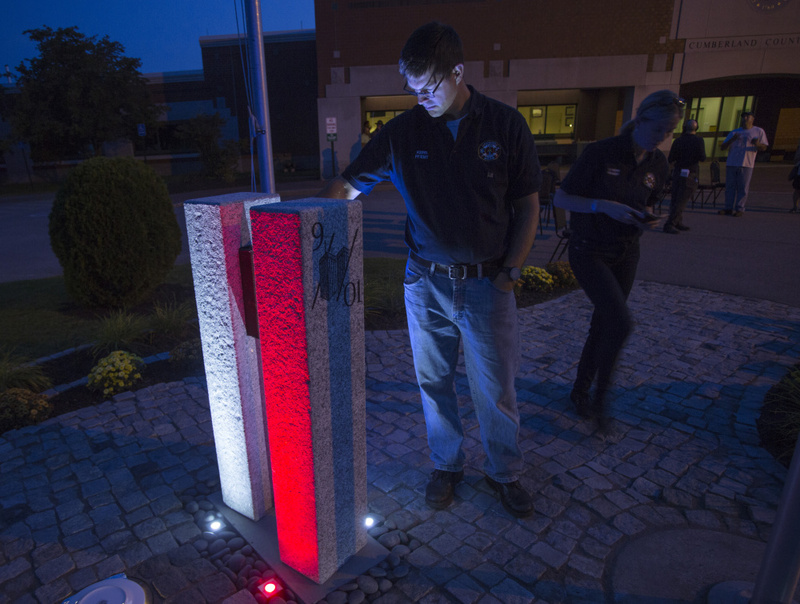 It was one of several events held around the state to mark the anniversary of Sept. 11. 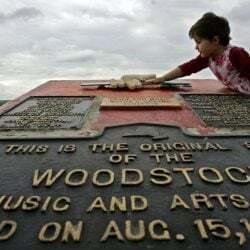 The sculpture contains a small piece of steel from the World Trade Center. 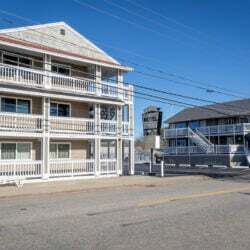 Cumberland County Sheriff Kevin Joyce acquired two pieces of the steel from the New York City Fire Department – one for the Maine Public Safety Pipes & Drums Corps and one for the sheriff’s department. 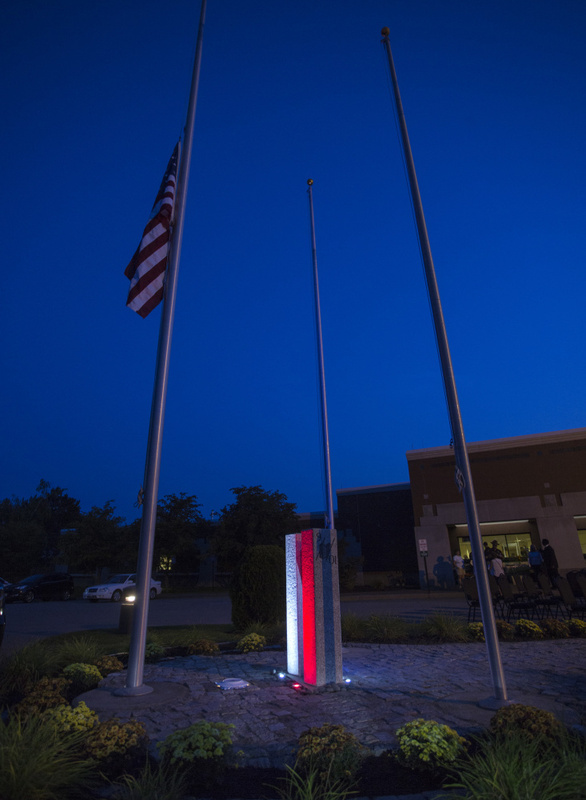 On the campus at County Way, the steel is cradled between two granite pillars that mimic the twin towers and are flanked by flagpoles. Many of the materials, including the metal itself, were donated to the sheriff’s department. 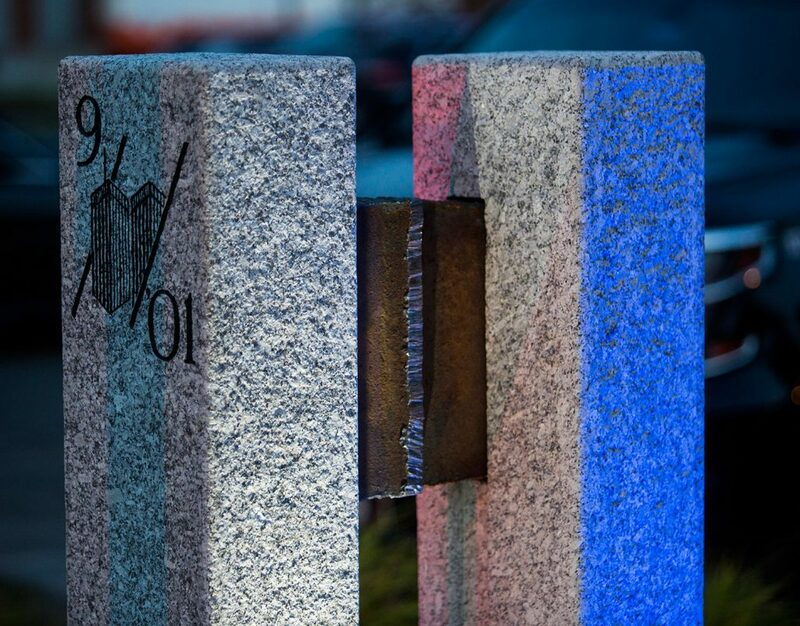 Joyce said he hopes the sculpture reminds Mainers of the victims, first responders, military personnel and others affected by the terrorist attacks. 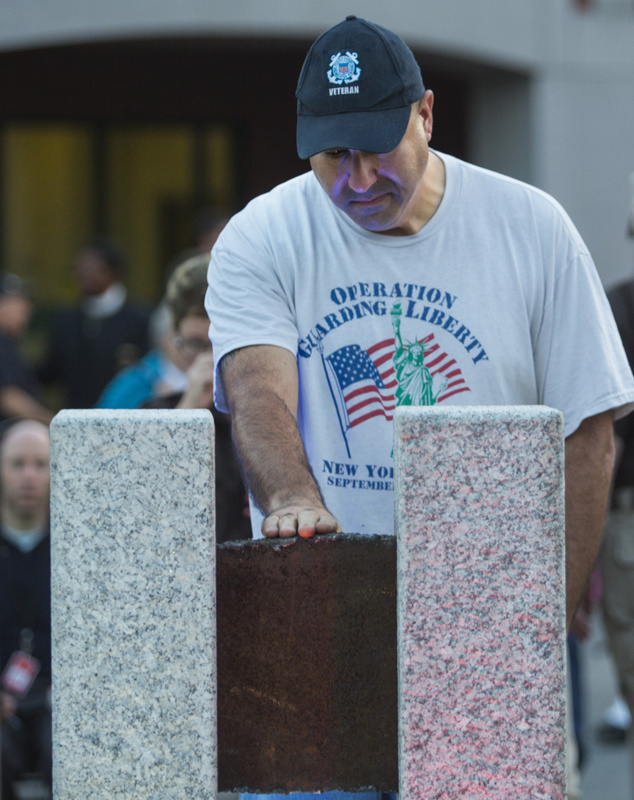 “This is a powerful monument to never let us forget all of those people,” Joyce said. The crowd of public safety officials and spectators gathered Monday to see the sculpture for the first time. Speakers included Maine’s U.S. Marshal Noel March, who helped Joyce connect with the fire department in New York, and the memorial’s sculptor, Gregory Ondo, an assistant professor of art at the University of Maine. For Colby, seeing the sculpture was emotional. He stayed as the crowd dispersed and the sky darkened. The air was warm, but he had goosebumps. 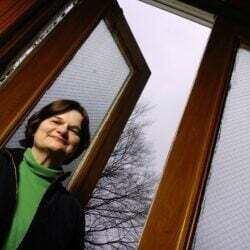 “It means the world to me to kneel down and touch it,” Colby said. 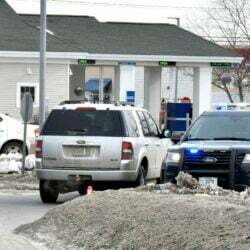 Other events Monday took place in Falmouth, Bangor, Auburn and communities elsewhere around the state. Earlier in the day, another commemoration took place in Greater Portland. 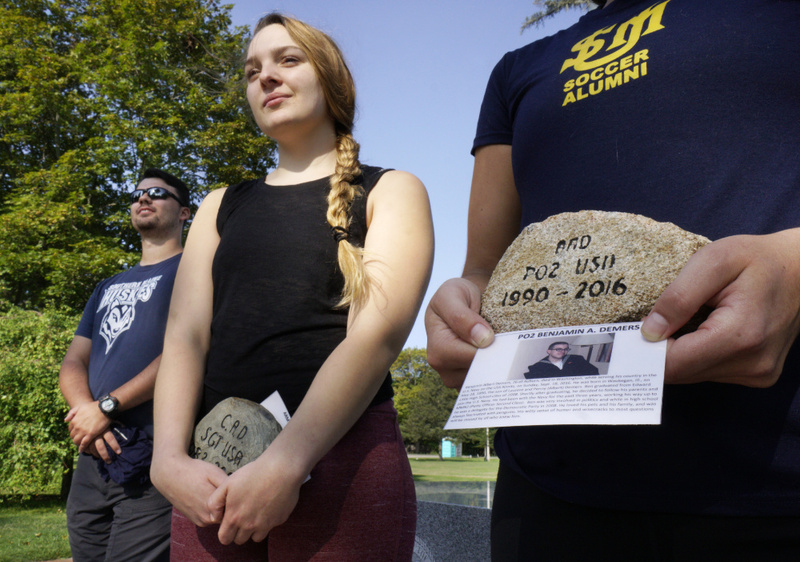 Carrying stones honoring deceased veterans from Maine, over 30 people walked 9.4 miles from the University of Southern Maine’s Portland campus to its Gorham campus to mark the 9/11 attacks on the World Trade Center and the Pentagon 16 years ago. 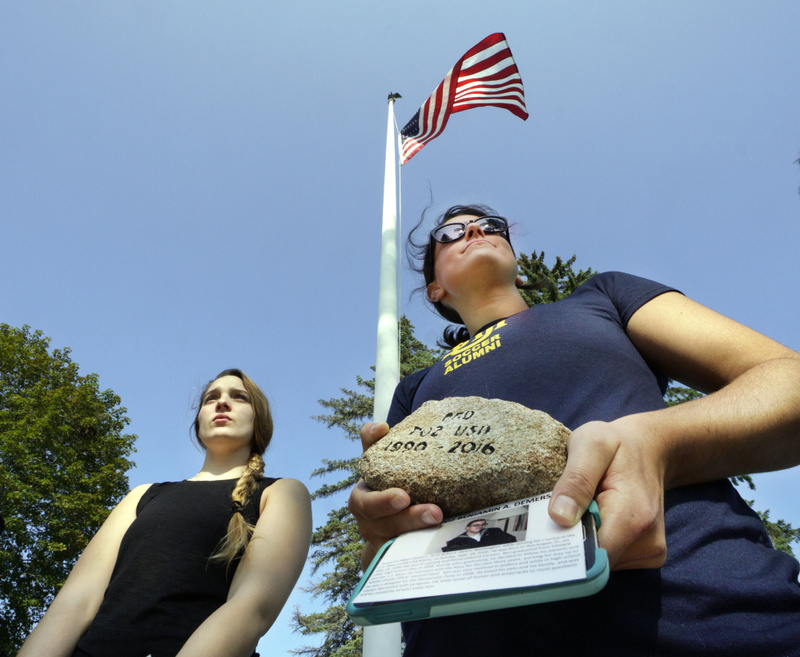 Along the way, the group stopped at Riverbank Park in Westbrook, where they removed the stones from their packs and held them as they stood in a circle at a veterans’ memorial. One by one, they talked about the service member their stone represented, telling stories about the person’s life and family, why they decided to serve in the military and the circumstances of their death. 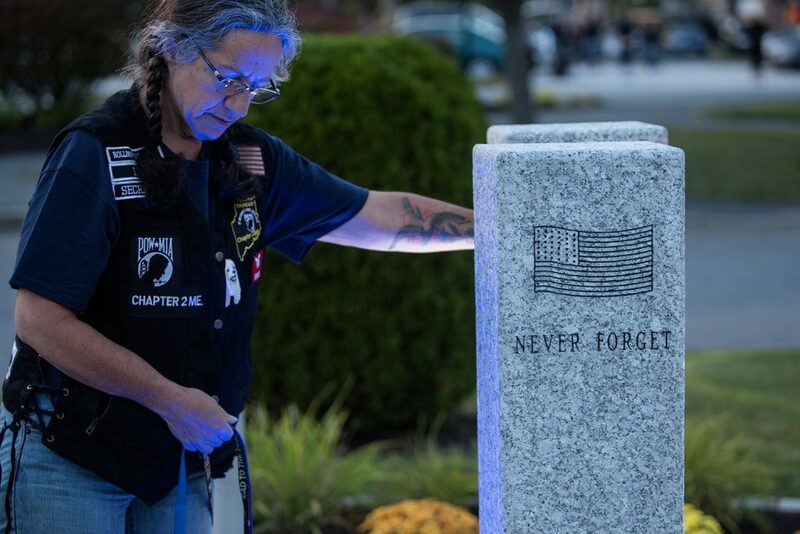 The program honors veterans who have died since Sept. 11, 2001. 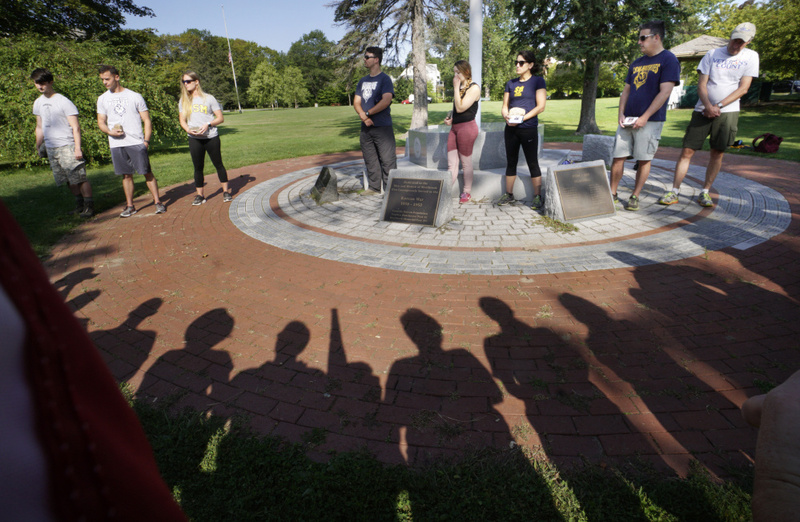 Ege organized the hike, which included veterans, USM students, faculty and administrators, in conjunction with The Summit Project, which formed in 2013 with the idea of carrying stones honoring soldiers to the summits of Mount Katahdin and Cadillac Mountain. “It’s pretty amazing that USM was able to put together an event like this on 9/11, which was the reason that so many of these service members joined the military,” said Greg Johnson, executive director of The Summit Project. 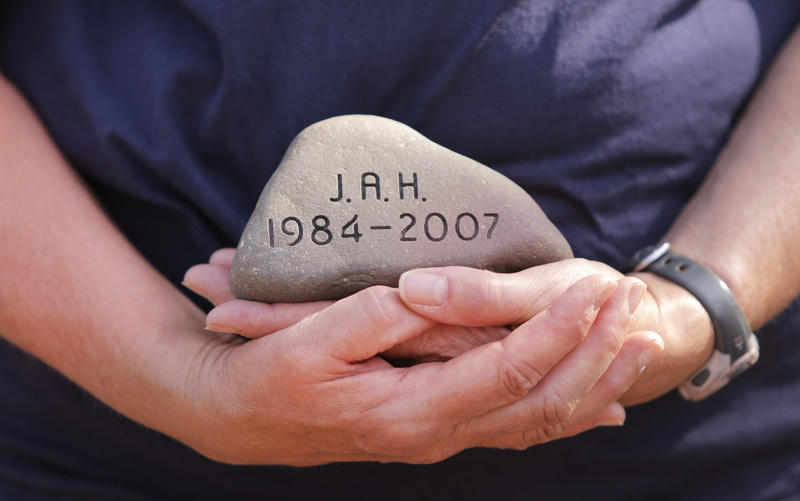 Each stone is engraved with a soldier’s initials, branch of service and dates of life on it.